So I have my card for Taylor's Cupcake Challenge finished but I haven't been able to take a picture of it yet. I will work on getting a picture up as soon as I can tomorrow morning! I apologize to those of you who came looking for it! I really like it though so I am excited to show you! Good morning everyone! It is a good morning here because my brother came to visit! :) It's unbelievable how much I miss him! Haha! We used to fight all the time growing up and now we can't seem to spend enough time together! Anyway, he is out here looking for a job because he is moving here permanently in January! Woohoo! For today's card I used the same colors and the same stamp set as I did for my workshop make & take only I used a different layout. I just love these colors together. I think they are absolutely gorgeous! This baja breeze is definitely a favorite color of mine! I can't seem to stop using it! In fact, I am almost completely out of it! Anyway, I used the Crazy for Cupcakes stamp set and added some dazzling diamonds to the sprinkles and flame. I colored the image with my Stampin' Up! markers and threw on some gorgeous double stitched baja breeze ribbon. Overall I really like how this card turned out! I think if I were to change something, I would wheel the chocolate chip piece. Anyway, don't forget that this set is 20% off (when you spend $20 or more) until tomorrow! To see the other sets that are included in this deal, click here! Well, that's all I have for today! I am SO glad it is Thursday! I am looking forward to a day off! Enjoy! Projects For My First Workshop! I have been a demonstrator since March and I JUST had my first workshop last Thursday! I had always wanted an opportunity to do one but had never found someone willing...until I met Holly! :) Holly and her hilarious friends were all friends of Leanne's so when Leanne dropped her demonstratorship, she told them about me! I can't even tell you how much fun I had at this workshop! We laughed non-stop! It was so much fun! Anyway, these are the make and takes that we did. The first one is a little triangle treat box that they could use for their students (they were all teachers). The second was a gorgeous card (that looks awful in this picture but I finally gave up) that we added dazzling diamonds to! I am seriously in awe at how much a little glitter can add to a card! It's unbelievable! I also wanted to show them how to use the scallop edge punch so I added that little touch to the bottom of the card! This was the hostess gift that I gave Holly. I found the dimensions for the box off of Cammie's blog. It was the perfect size for the ribbon, punches, and stamp that I wanted to include inside. I just added a handle for some height. I really like how it turned out too! Well, thanks for listening to me brag about my first workshop. I will admit that my presentation was really rough and rocky but it was still a blast! Good morning everyone! How are you all? Today's card is one that I made on Friday and am just now getting around to sharing with you! I looked at Beate's weekend sketch challenge Friday morning and then looked at her sample. I didn't really pay a lot of attention to it at first but after I had finished mine I realized that my card looks A LOT like hers! Haha! I guess I was just really inspired! :) Thanks Beate because I think this card is gorgeous! :D Anyway, I had been dying to use my new Alpine ribbon and Ski Slope paper but I wanted to pick a piece that wasn't going to clash with the ribbon or the star from the Scandinavian Season set. I originally was going to use the opposite side of this kiwi kiss piece but thought it made everything look to busy. That is when I tried flipping the paper to try the other side (since it was already cut). So, this is the result! Striking resemblence huh? Well, that's it for this morning! Today is the last day Nick's parents will be here so we are going to get as much QT in as possible! Enjoy your day! Good morning! It's Paper Pretties Monday and I couldn't be happier with this adorable card! :) I just love how these bright colors all go so well together! I pulled the color combination from this piece of My Mind's Eye dp. The sketch is also one that Danielle posted over on the Paper Pretties forum last week. I completely forgot about it and decided to use it for this week! :) Doesn't little Sophia just look so excited to be going to school? That's definitely not how I am feeling this morning! Haha! Anyway, make sure you check out the Paper Pretties store to see this stamp along with all the other fabulous stamps for sale there! I will be back tomorrow to show you a new card, until then, have a wonderful day! I absolutely LOVE these Stampin' Up! Level 1 Hostess sets! They are absolutely gorgeous! I had been dying to play with Julee's Mojo Monday sketch so I paired it with both of these stamp sets! The images are from the set "Organic Grace" and the sentiment is from the set "Best Yet". I also used the Windsor Knot dsp and Sage Shadow ribbon. The colors are so elegant together! I really love how this card turned out. I am not sure if you can tell but the dragon flies are cut out and popped up on dimensionals. It has such a cool effect! Well, that's it for tonight! I am going to go spend more time with the in-laws! Have a super evening everyone! Isn't this house from the There She Goes set "Spooktacular Silhouettes" amazing??? I just LOVE the chubby and curly design of it! It's so neat! Currently this set is 50% off too! Anyway, I paired it with Jen del Muro's Sketch for You To Try and love the final look of it! This card came together really quickly, the toughest part was trying to figure out what colors I wanted to use! Haha! Once I decided on the colors, it came together in a snap! Another short post today because Nick's parents are visiting! We have enjoyed having them out so far and want to get as much time with them as we can! Make sure you stop by the There She Goes store to see the other sets that Jessica has for sale! They are all fabulous sets! Good morning! I am super tired this morning because of my SU! workshop last night! Leanne and I had so much fun but it was a 2 hour drive so we didn't end up getting home until 12:30. Anyway, I wanted to share today's cute card with you! This week Taylor provided us with a fantastic sketch! It was so unique and I just loved the little panels that were included in it! The only thing I struggled with was how to incorporate these adorable new cupcake images into it! It didn't take me long to discover that they would work perfectly as the circles! Haha! How cute do these little carolers look though? My husband liked the card so I figured it couldn't be too bad. He usually tells me straight up when he doesn't like it! :) Anyway, these stamps are from the Taylored Expressions set "Home Sweet Home". The paper I used is also from the Taylored Expressions Christmas Key Ingredients kit! I just can't get enough of the fabulous dp that is included in it! It is just gorgeous! Well, as always, make sure to stop by Taylor's blog for all the sketch details. Also, you must check out this week's Featured Cupcake Sampler, Kathie Bailey and her blog, Just an Inkling. She is amazingly talented! "We’re introducing our Campaign to Spread the Sweetness! If you’d like to help spread the word about Stamp a Sweet Impression and our newest Holiday release, please post a link on your own blog to Taylored Expressions (the Blog) where your readers can get all the deets (here’s the link you need to post: http://www.tayloredexpressions.blogspot.com/) and say something sweet about TE or SASI. And for helping us Spread the Sweetness we’ll hold another drawing on Sunday October 26. Simply leave a comment before 8am PST Sunday on this post to let us know you Spread the Sweetness and you’ll be entered into the drawing! And what sweet prize do we have for you this time? How about the brand new Christmas Key Ingredients Kit? Yep! One lucky Sweetness Spreader will win this luscious kit!" So I forgot to type my post early! I am so sorry to those of you who came looking for my Taylored Expressions projects! I feel horrible about it! Anyway, I am now home from my workshop (which went well) and am ready to post! For tonight's projects, Taylor is showing the new set "Tag Treats"! This set has the most fabulous sentiments in it and I chose to showcase my favorite one which says "You've been naughty so here's the scoop, all you get is snowman poop!" Too cute huh? She is also releasing the other two sets "Season's Sweetings" and "Home Sweet Home", all of which you can purchase at the Taylored Expressions store! Anyway, I paired this cute sentiment from the "Tag Treats" set with the adorable snowman cupcake from the "Home Sweet Home" set to make a perfect little gift(s). Now, my original idea was to just use the Starbuck's Frappacino bottle for the gift but then I saw all the other glass ornaments laying there and I decided to decorate ANOTHER one! For the bottled marshmallows I just used the fabulous paper and ribbon from the new Christmas Key Ingredients Kit to decorate it. I had never attempted to cover a frappacino bottle before and it was a piece of cake! The hardest part was trying to figure out how to attach the adorable tag! The ornament was pretty quick to come together too. All I had to do was color the snowman, cut him out, adhere him to the globe and then stamp the sentiment on the back. I then decided to add the cute ribbon bow as a final touch! I Can't Get Enough of this DP! Good morning everyone! Today's is going to be a great day, I can just feel it! Not only is it Thursday (the last day of work) but I have my very first workshop tonight with a bunch of FUN women! :) I have prepared for this thing like crazy and I feel very ready! Anyway, since I have a SU! workshop tonight I decided that I need to post a SU! only card today! I just love how this card turned out too! I used one of Beate's old Weekend Sketch Challenges so I pulled some of this Frosty Day (I think that's the name) dsp to use as the strips! I just think it's absolutely gorgeous! I LOVE the colors in it! Anyway, that's all I can share for now because I have to run to a meeting! Have a great morning! P.S. Make sure you check out the Baker's Dozen Rotating Design team today to check out their sneak peeks for tonight's Taylored Expressions/Stamp a Sweet Impression release! Stamp a Sweet Impression Sneak Peeks on my Birthday!! Anyway, Taylor has so many sweet designs that she is releasing this month! I am so excited about this release too because they are Christmas stamps and Christmas is my favorite holiday! When I first saw these sets I was in love and I am sure you will feel the same! Today's sneak peek is from a set called "Season's Sweetings". I am only going to show you a few images but you can check out the other Senior Design Team members to see some others! For my card I used this adorable little image! I just love to see a cupcake decorating a Christmas tree! It is so cute! The paper is all from the soon-to-be-released Christmas Key Ingredients Kit and I added some brads to the tree for a little added dimension! Now I have always wanted to make something using these clear glass ornaments so when I came across them again at Hobby Lobby I snatched them up knowing I could figure something out! I then decided to dump some of the glitter from the soon-to-be-released Christmas Key Ingredients Kit. I also attached some ribbon (also in the kit) to the top, cut out and stuck the adorable little earmuff cupcake to the front, and tied on the sentiment! Isn't it cute??? Anyway, I hope you enjoyed today's little peeks! Again, make sure you check out the rest of the Baker's Dozen Senior Design Team blogs today along with Taylor's blog. They have some fantastic projects to show as well! It's me again! I just wanted to let you all know that I just finished editing my Stampin' Up! website and have added a great video to the homepage. If you are interested, check it out here! Just a little side note, I am currently in the process of editing the details for my projects (under the Creative Projects link) and will hopefully get that finalized this week! If you happen to look at them, ignore the recipes because they're not correct yet! Isn't Cooper just adorable??? I love this Paper Pretties image so much! He looks so happy to be going to school! Hehe! If only all my students were that happy to go to school! Anyway, I used my stash of My Mind's Eye dp for this card and I pulled the colors from it. I then colored Cooper with my SU! markers and popped the image panel up on dimensionals. This card came together fairly quickly because of how simple it was. Oh, I almost forgot! I used the OCC sketch challenge from Saturday on this card! Well, that's it for now! I have to run! Have a great Monday everyone! Who Doesn't Love This Guy??? He's so adorable! I just love his skinny arms and legs! Haha! You can get this set from the Stampin' Up! Occasions Mini catalog and he is super cheap! The minute I saw him I knew I HAD to have him! :) Anyway, for this card I used Julee's Mojo Monday sketch challenge from a couple of weeks ago. I love all the layers and elements that were included in the sketch so I wanted to use it. I also used my Frosty Day dsp to accompany the little guy. The colors are very non-traditional and I just love that. I also used my fabulous Alpine Felt Ribbon from the mini catalog. If you haven't tried this stuff, you need to! It is spectacular! Finally I cut out some little presents and put them in the build-a-brads. That part was Nick's favorite element on the card! He thinks they look very 3D. Anyway, thanks for stopping by my blog today! I will have another card to share (hopefully) later this afternoon! SASI News & Blog Candy!!!! Hey everyone! I have three important announcements to make! 1. There is some fun blog candy being given away over on the Stamp a Sweet Impression blog! Make sure you head over there to read all the details. 2. We are starting a new thing called Our Friday Friend. This basically means that Taylor is going to scour the SCS gallery looking for cards/projects using the Stamp a Sweet Impression stamps. If you are chosen, you will then be asked to be the Our Friday Friend! How cool is that??? Anyway, there are more details on that over on the SASI blog so make sure you read it. 3. 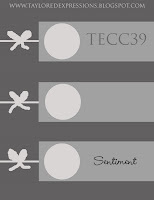 TE/SASI is preparing to release THREE new sets on Friday! They are absolutely fantastic so make sure you stay tuned for sneak peeks starting Wednesday! Ok, that's all I have for tonight! I am off to bed now! Oh my! Where did the day go? It was such a gorgeous day here so Nick and I took the time to just enjoy each other. We have a piece of property in the mountains that we hope to build on some day so we headed up there to just enjoy this beautiful fall weather. How wonderful it is to know that God is in control of everything and what better reminder is there than just being in His creation? Anyway, it was time well spent but I am sad to see the day end! For this card I used the gorgeous There She Goes set called "Here For You". I just love the images and sentiments in this set. They are so heartfelt and touching. I stamped the image in Sage Shadow ink and then put crystal effects over the blooms for an added pop. I also added the ribbon over the image panel in order to put more focus on it. I really love how this card turned out. I think it has such a neat look. Make sure you check out the rest of the set over on the There She Goes website along with the other sets that are for sale. You will not want to miss them! Taylored Expressions Cupcake Challenge #38! Good morning! It is a chilly but sunny morning here! It's a great day to stamp! :D I hope to get quite a bit done too! Anyway, today's Cupcake Challenge was a fun one. I wasn't sure what I wanted my card to look like at first but once I had an idea, it was a piece of cake to put together! For my card I pulled out the fabulous Scandinavian Season set that you can find in the SU! Mini Catalog. I fell in love with this set the minute I saw it! It is so elegant and perfect for Christmas! I also love the non-traditional colors that are being used on Christmas cards this year so I decided to follow that theme again. I absolutely LOVE this color combination! Baja Breeze and Kiwi Kiss look fantastic with Chocolate Chip (in my opinion)! To finish up this card I added some yummy Chocolate Chip ribbon and silver brads. I also stamped the tree in Kiwi Kiss so that I could cut out the flower and pop it up on dimensionals. I think it is such a neat look and it really adds so much. The only part I struggled with on this card was the sentiment. I wasn't sure how I wanted to do it. I finally decided to pull the sentiment from the All Holidays set, stamp it on Kiwi Kiss cardstock, and position it sideways right beside the image. I am really glad I chose to do this because it has a cute look. So, enough of me bragging on this card, I hope I don't sound conceited about it, I just really like it! :) Before you leave today, make sure you stop by Taylor's blog to see her fantastic card! She has also picked Tori Wild to be her Featured Sampler today! Tori is incredibly talented so you will not want to miss her blog! Hello everyone! I hope you are all enjoying your Tuesday evening! Today's card is one that I made for my amazing little brother. He shot a buck last week with his bow (his first big kill with a bow) and I wanted to make a card for him using my brand new Nature Silhouettes set! I pulled out another old Splitcoast sketch challenge for this card and paired it with my new Windsor Knot dsp! I really like how this card turned out and am pleased to say that he liked it as well! It was the first card I had made for him so he felt very special! Haha! Anyway, another short post again tonight. I am exhausted and am heading to bed EARLY! Woohoo! Take care and have a fantastic night! Oh, and for those of you who are curious, here is my brother with his buck! Good evening everyone! Today's card is one I made using the newly released Pick of the Patch set from Paper Pretties! Isn't Cooper just adorable? I love him in that little pumpkin costume! Make sure that you check out the rest of the set along with the other new releases! They are not to be missed! Anyway, to make this card I used one of the old Splitcoast sketches for this card. I pulled out my Haiku dsp to match the Old Olive and Pumpkin Pie color combination too. I just love these two colors together and I think they make wonderful Halloween colors! I also colored Cooper with my Stampin' Up! Markers. I added some black accents with the ribbon and brads and finished the card by paper piercing along the sides. Overall I really like how this card turned out. I didn't have room for a sentiment on the front so I stuck one on the inside! Well, that's all I have for today! Thanks so much for stopping by! Sorry for this post being so late tonight! I am still in Iowa and am trying to get as much time in with my family as I can! I still wanted to share this card with you though so here goes! I made this card using MJ's Monday Lunchtime Sketch challenge! I love her sketches and have not found the time to do them lately. I used my fabulous Branching Out set from There She Goes. I also combined it with the fabulous Autumn Vine dsp from Stampin' Up! Well, that's all for now! Thanks so much for stopping by! My regular posting will (hopefully) continue on Monday! Until then, take care!